Blueberry bushes are part of an important industry. In the wild, blueberries support the survival of bees and some species of bears. Unfortunately, only certain zones can support a blueberry bush's needs without significant intervention by the grower. 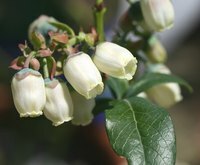 Blueberry bushes need specific growing conditions to thrive. Excessive wind, dryness and alkalinity in the soil can damage and weaken blueberry bushes. Growing them in a greenhouse can give blueberry bushes a more controlled environment and a greater opportunity to produce berries. Prepare the soil. According to Colorado State University, blueberry bushes need an acidic soil to thrive. Researchers found that a mix of 40 percent coir (shredded coconut husks), 40 percent peat and 20 percent perlite provided the adequate range of acidity at a pH around 4.8. Plant the blueberry bushes. If your greenhouse has a maintained temperature, plant each of the blueberry bushes in 2-gallon pots. Double-pot the blueberry bush. If your greenhouse is not temperature-controlled, provide some protection from freezing temperatures by planting each blueberry bush into two pots. Dig a hole in the soil and place a large, partially soil filled pot into it, followed by the 2-gallon blueberry bush pot. Water the blueberry bush. Frequently check the moisture of the blueberry bushes as they do not tolerate dryness well and could produce fewer berries if not properly maintained. When watering multiple blueberry bushes, Colorado State University found that an automated drip system worked effectively. Fertilize the blueberry bushes. Use a 14-14-14 slow-releasing fertilizer. Maintain the soil pH. Periodically check the pH of the blueberry bush's soil to make sure it is maintaining an ideal range between 4.5 and 4.8. If the soil becomes too alkaline, switch to a high acid-soluble fertilizer. Remove the blossoms in the spring if the bushes are not thriving. This encourages the growth of the roots and a better-established plant. Prune the blueberry bushes. According to Ohio State University, mature blueberry bushes need yearly pruning to encourage berry production and maintain overall plant shape. Remove all broken and diseased stems and those that are older than 7 years. Winter forcing of blueberries is possible by keeping blueberry bushes outside until January. While outside, secure the bushes to a structure to protect them from wind. Protect the branches with burlap, which also increases humidity around the plant. Once in the greenhouse, sprouts should open quickly. Do not prune more than a couple of mature stems in one year.